I can tell from newsletter subscriptions and my email inbox (please don’t ever stop writing me) that there are a lot of new faces stopping by DALS to check out what we’ve been doing here for the past two and a half years. So longtime loyal readers, please forgive me while I indulge the urge to do a little summary for our first-time visitors. First-time visitors: Welcome! Your pop quiz on skillet meals will not be administered until next week, but today I’d like to present to you the most fundamental of DALS Strategies for Family Dinners. It’s known around these parts as The Principle of Deconstruction and — are you paying attention, because it’s complicated — it goes like this: If you are tired of being a short-order cook for your daughter who hates chicken but likes avocado and your son who hates avocado but likes chicken, and your toddler who only eats olives and cheese and caviar, you do not have to make three separate dinners. The key is to pick one meal that can be broken down into its individual ingredients (aka deconstructed) and reassembled the way your diners like it. That way, even though everyone is eating something different, you have only made one meal and, more important, you do not have the urge to politely excuse yourself then scream at the top of your lungs into the clothes dryer. I’ve gone on and on about deconstructing, I know, and there is a huge section in my book devoted to recipes that are conducive to this strategy, but lately I’ve been applying the Theory of Deconstruction to soups with much success. Look how I turned my 15-minute Tortilla Soup into for my soup-hating 8-year-old? Nice right? The broth becomes a dip, and all the ingredients that she prefers…you know, dry…get placed on her plate before any offensive simmering begins. 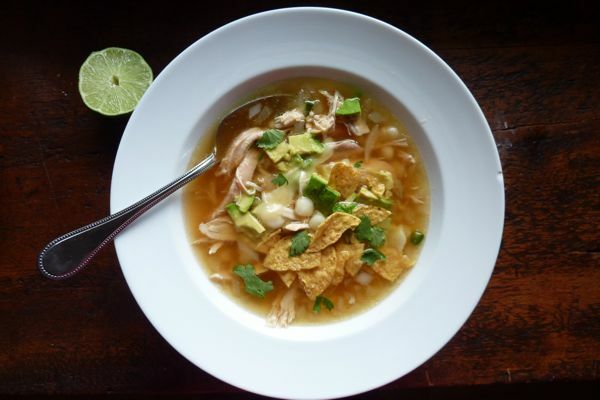 Tortilla Soup is made with shredded chicken, avocado, and hominy among other things and is insanely easy to put together. Brown the chicken in a medium saucepan, about 2 minutes on each side. (It does not have to be cooked through. If using rotisserie chicken, shred it and continue to next step.) To the same pan, add oil and saute the onion, garlic, jalapeno pepper, and salt and pepper over medium heat for about 3 minutes. Add the broth, chile pepper, and hominy and bring to a boil. Reduce the heat and simmer for 15 minutes. Remove the chicken from the pot and shred using two forks. Add the shreds back to the pot and simmer for another 5 minutes. 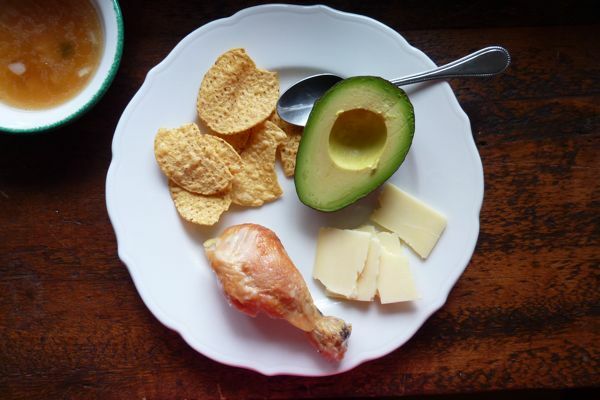 If your kids will only eat the components of this soup and not the soup, lay out the components (chicken, cheese, avocado, etc) on a plate the way they’d find it least offensive. Then ladle the soup servings into bowls, you know, the way it was meant to be served, squeeze lime into each bowl and add the toppings. Deconstructable meals are the best strategy ever. With all this buzz over your new book, I too am a fresh new reader to DALS. This is a wonderful concept and I look forward to reading your blog and your new book! one of my (many) favorite aspects of DALS: these sight-gaggy photos of the same meal, as presented to a child. this one might be the funniest one yet. I’m wondering if it is okay to get your book on the Kindle or if I will be missing out on something. Is there artwork that won’t be in the kindle version? Girl, you just deconstructed soup. That’s so rad! You=awesome. That is some creative work, there. We had mexican salad bowls for dinner tonight: salad on the bottom and choose your own toppings for the rest (rice, beans, veggies, grilled meat, avocado, green chiles…) It’s amazing how of the 6 people at the table, each had a slightly different permutation. I’ve been a reader for a few months so I’m not sure if you’ve hit on this, but this is also a great strategy for feeding family members with allergies. My daughter has a crazy sensitive digestive system and eats no dairy or grains, among other things, so I usually just pull out portions of the meal for her plate before making the adult version. I’ve done the same for baby food for our little one. Reserve some steamed veggies and purée them, etc. I’ve never bought baby food for her using this. Thanks for the tortilla soup recipe. If you don’t mind, can you submit your tortilla soup photo in http://www.foodporn.net ? set out in separate bowls, picky kids have watermelon, all other mix and match. We had this for lunch (kids come home at lunchtime in Switzerland, makes two love stories a day for me), together with rotisserie chicken, new potatoes, cucumber slices and fragolino tomatoes (sooo much better than cherry). Topic at lunch: secret languages (double every vowel and insert a p in between. TALK FAST, as in dipinneper apa lopovpee stoporypy ropocks. Wow, soup my daughter will eat! Well, she wouldn’t eat avocado, but a bit of grated carrot goes in almost any soup, and that she will eat.